There are several aspects of the R language that make it hard to learn, and repeating a model for groups in a data set used to be one of them. Here I briefly describe R’s built-in approach, show a much easier one, then refer you to a new approach described in the superb book, R for Data Science, by Hadley Wickham and Garrett Grolemund. For ease of comparison, I’ll use some of the same examples in that book. The gapminder data set contains a few measurements for countries around the world every five years from 1952 through 2007. Let’s create a simple regression model to predict life expectancy from year. We’ll start by looking at just New Zealand. Since we have so many countries, that wasn’t very helpful. Much of the output scrolled out of sight (I’m showing only the results for the last one, Zimbabwe). But in a simpler case, that might have done just what you needed. It’s a bit more complex than how SAS or SPSS would do it since it required the creation of a function, but it’s not too difficult. In our case, it would be much more helpful to save the output to a file for further processing. That’s when things get messy. We could use the str() function to study the structure of the output, then write another function to extract the pieces we need, then apply that function, then continue to process the result until we get what we finally end up with a useful data frame of results. Altogether, that is a lot of work! To make matters worse, what you learned from all that is unlikely to generalize to a different function. The output’s structure, parameter names, and so on, are often unique to each of R’s modeling functions. Luckily, David Robinson made a package called broom that simplifies all that. It has three ways to “clean up” a model, each diving more deeply into its details. Let’s see what it does with our model for New Zealand. The glance() function gives us information about the entire model, and it puts it into a data frame with just one line of output. As we head towards doing a model for each country, you can imagine this will be a very convenient format. To get a bit more detail, we can use broom’s tidy() function to clean up the parameter-level view. Now we have a data frame with two rows, one for each model parameter, but getting this result was just as simple to do as the previous example. Now any other function in the dplyr package will understand that the by_country data set contains groups, and it will process the groups separately when appropriate. However, we want to use the lm() function, and that does not understand what a grouped data frame is. Luckily, the dplyr package has a do() function that takes care of that problem, feeding any function only one group at a time. It uses the period “.” to represent each data frame in turn. The do() function wants the function it’s doing to return a data frame, but that’s exactly what broom’s functions do. Let’s repeat the three broom functions, this time by country. We’ll start with glance(). Now rather than one row of output, we have a data frame with one row per country. Since it’s a data frame, we already know how to manage it. We could sort by R-squared, or correct the p-values for the number of models done using p.adjust(), and so on. Next let’s look at the grouped parameter-level output that tidy() provides. This will be the same code as above, simply substituting tidy() where glance() had been. Again, this is a simple data frame allowing us to do whatever we need without learning anything new. We can easily search for models that contain a specific parameter that is significant. In our organization, we search through salary models that contain many parameters to see if gender is an important predictor (hoping to find none, of course). Finally, let’s augment the original model data by adding predicted values, residuals and so on. As you might expect, it’s the same code, this time with augment() replacing the tidy() function. If we were to pull out just the results for New Zealand, we would see that we got exactly the same answer in the group_by result as we did when we analyzed that country by itself. We can save that augmented data to a file to reproduce one of the residual plots from R for Data Science. 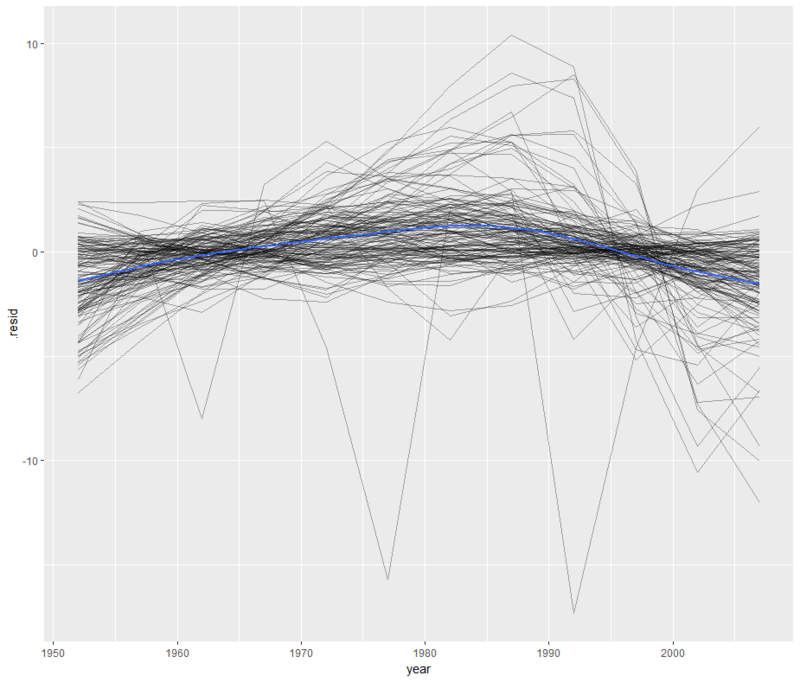 This plots the residuals of each country’s model by year by setting “group=country” then it follows it with a smoothed fit (geom_smooth) for all countries (blue line) by leaving out “group=country”. That’s a clever approach that I haven’t thought of before! Each of those models contain similar information, but often stored in a completely different data structure and named slightly different things, even when they’re nearly identical. While that covers a lot of model types, R has hundreds more. David Robinson, the package’s developer, encourages people to request adding additional ones by opening an issue here. If your organization is interested in a hands-on workshop that covers many similar topics, please drop me a line. Have fun with your data analyses! This entry was posted in Data Mangement, Data Science, R, Uncategorized. Bookmark the permalink. Or you could just stick to base R, use the split function, and avoid all this tidy, broom, purr, and whatever else you need non-sense. Thanks for that variation. What’s missing is any actual output. Now you have to decide what parts of those models you want to see, figure out how your models object is structured, what its components are named, how to write a custom extraction function (one that will be different for *every* type of modeling function you use besides lm), and then lapply that. All those steps broom greatly simplifies. Where you and I probably agree though is this question: does Chapter 25 (update: in the printed version of the book, it’s Chapter 20) add anything significant to R’s built-in approach? Both your approach and that chapter offer the total flexibility to use with any modeling function, not just the 96 that broom supports. However, that flexibility comes at the cost of extreme complexity. For professional full-time data scientists, statisticians, et al, one of those will be good to know, but for your average researcher who uses R for occasional data analysis, both of those approaches may be too much for them to handle. I have found even occasional users can handle the broom approach without much effort. To me, the great appeal of the tidyverse is that it makes some things that are hard to use in R easier. So far, I don’t see that the Chapter 25 approach does that. Thanks for your reasoned response. I still prefer the base way for portability, disagree with extreme complexity, and not re-inventing the wheel. Many people find piping less intuitive and harder to read. The examples I see go out of the way to make base programming look bad, when no one would actually code it that way. Due to their extreme social presence new/existing R users may incorrectly believe the tidyverse is the most dominant, perhaps only, way to do things in R. In fact, the data.table package is much more appealing in that it fundamentally takes a different approach to is many times faster then the tidyverse. I agree that piping can be quite a mess to read if it’s taken too far. In their book Hadley & Garrett give some good advice on when to NOT use piping. You make an excellent point about the dominance of the tidyverse in social media. I deal with beginners a lot, and they’ll often read a classic book on R, then start reading the many posts on R-Bloggers.com and wonder if R is splitting into two very different languages. data.table is an excellent package. The benchmarks I’ve seen put it at more like 10% faster than dplyr, but I’d definitely like to see references that show more extreme results. plyr performance may be what you’re thinking of, it was radically worse than data.table. Both data.table and plyr seemed like consistent extensions to the R language, while dplyr is more like jamming SQL into R using R-like syntax. Being an SQL fan, I like that approach, but I can certainly see why R purists would not. Cool post. Perhaps it’s worth recalling the aged but still impressive nlme package that ships with base R and the venerable lmList() function…. which come with summary() and anova() functionality…. specifically designed for structured data like this. In fact, it’s ported to the lme4 package too, for exploring linear models among grouping variables, before pressing onto random effects/mixed effects modelling. The tidyverse additions are valuable for sure though. Nice output! I’ve never used that function, thanks for pointing it out. Can you use the models to predict on new data? Since this approach develops the model and makes the predictions both together in the augment step, I think the only way to apply the models to new data would be to append the new data to the original data set, but with missing values as the prediction. They would then be excluded from model generation but included for prediction. Thanks. Is multiple regression handled the same way, and is there an way to obtain forecasts? Yes, multiple regression would work the same way. To handle forecasts with this approach, see my reply to Jason below. Hoever, if you wanted to save all the models to apply regularly to new data as it arrives, it would probably be easier to use the more complex approach described in R for Data Science. How can I get all the output of R-squared, p-values, slope and intercept for all the countries. I mean how can I save it to a new file ? Thanks a lot for the information. It was very helpful indeed.